Smartwatches aren't the easiest things to control, with their small screens and owners' bulky fingers. Georgia Institute of Technology researchers have invented new ways to interact that provide a little more control. Ph.D. student Cheng Zhang oversaw WatchOut, an interaction technique that uses taps and scrolling gestures on the case and watchband, "outside" the watch screen. They're possible because of the watch's gyroscope and accelerometer sensors. "Other techniques that improve control of smartwatches have included 3-D gestures above the screen, bigger screens or adding an extra armband," Zhang said. "We wanted to show it could be done with existing technology already common on today's devices." They also created an app that creates eight touchpoints on the device's bezel. Rather than scrolling through a long list of apps, the user simply hits one of eight spots on the case to launch Facebook, for example. Hitting the sides of the watch can also control incoming calls. "Smartwatches aren't very convenient when you're carrying something," Zhang said. "That's why we wanted to create a technique that allows the user to tap the watch to accept or deny phone calls. Hitting the right side answers the call; the left side ignores it." Hands-free control is exactly what the other Georgia Tech team, led by Ph.D. student Gabriel Reyes, had in mind. One day he watched his wife blow a piece of fuzz off her phone while holding their newborn son. He and a team of students later created Whoosh, a technique that allows a person to control the watch by blowing, exhaling, shushing, sipping or puffing on the screen. The watch uses its microphone and machine learning to identify the breath patterns of each acoustic event, then assigns an action to each. Reyes and his team are excited that they've proven the technology works. He says it could have potential for people with disabilities. "The sip and puff technique has been used to control wheelchairs," he said. "Perhaps Whoosh could be the foundation for developers looking for ways that allow more control for those who can't easily interact with their mobile and wearable devices." 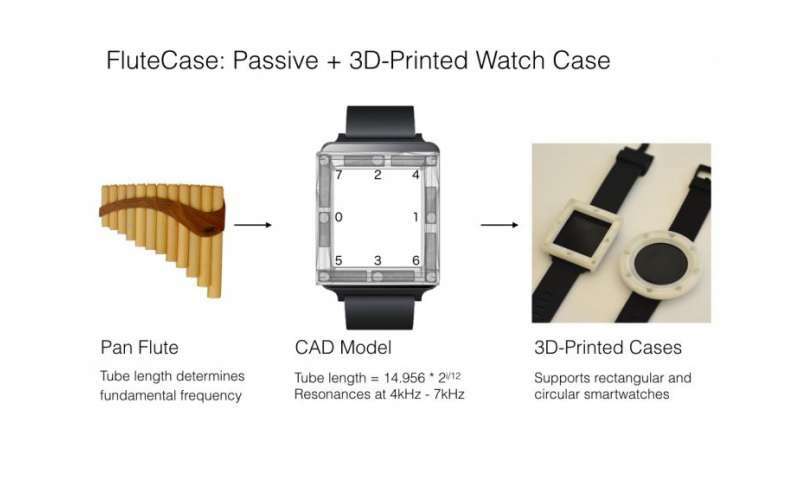 Dingtian Zhang, a Ph.D. student and labmate of Reyes, also designed a 3-D-printed case that snaps onto the watch. The attachment has eight holes around the bezel, each with varying lengths. When a wearer blows into each of the holes, unique frequencies are generated much like a flute. The watch's microphone and the Whoosh system detects the subtle differences in the frequencies produced and identifies the intended target. Each target is linked to a specific action within applications. The final project, TapSkin, allows users to tap on the back of their hand to input numbers 0-9 or commands into the watch. The technique uses the watch's microphone and inertial sensors to detect a total of 11 different tapping locations on a person's skin around the watch.